Zion Market Research has published a new report titled “Ophthalmic Drugs Market by Drug Class (Anti-inflammatory Drugs [Non Steroidal Anti-Inflammatory Drugs and Steroids], Anti-Infective Drugs [Anti-Fungal Drugs, Anti-Bacterial Drugs, Anti-Viral Drugs, and Others], Anti-Glaucoma Drugs [Alpha Agonist, Beta Blockers, Prostaglandin Analogs, Combined Medication, and Others], Anti-Allergic Drugs, and Others), by Type (Prescription Drugs and Over-the-Counter Drugs), by Disease Indication (Dry Eye, Allergies, Glaucoma, Retinal Disorders, Inflammation/ Infection, Uveitis, and Others), and by Distribution Channel (Hospital Pharmacies, Retail Pharmacies, Online Sales, and Others): Global Industry Perspective, Comprehensive Analysis and Forecast, 2017 - 2024”. According to the report, global ophthalmic drugs market was valued at approximately USD 25.03 billion in 2017 and is expected to generate revenue of around USD 34.52 billion by end of 2024, growing at a CAGR of around 4.70% between 2018 and 2024. Ophthalmic drugs are used in the treatment of cataract, retinopathy, glaucoma, diabetic, and other disorders. Introduction of new approaches to deliver ocular drugs in the market have driven most of the manufacturers in the market to develop more innovative therapeutic approaches for the treatment of ophthalmic disorders. 12 million people suffer from macular degeneration (AMD) related to age in the U.S., as per the American Academy of Ophthalmology, while about 10-12% of them are affected by wet AMD. These trends in ophthalmic disorders are boosting the growth of the market for ophthalmic disorders. The ophthalmic drugs market is divided on the basis of drug class into anti-inflammatory drugs, antiglaucoma drugs, anti-allergic drugs, anti-infective drugs, and others. The anti-inflammatory drugs are further segmented into nonsteroidal anti-inflammatory drugs and steroids. The anti-infective drugs are further divided into anti-fungal drugs, anti-viral drugs, antibacterial drugs, and others. The anti-glaucoma drugs segment is divided into combined medication, an alpha agonist, prostaglandin analogs, beta blockers, and others. The anti-infective drugs segment dominated the market in 2017 due to increasing incidences of allergic conjunctivitis. However, anti-glaucoma is anticipated to be the fastest growing segment in the forecast period due to the introduction of different therapies with a novel mechanism of action under this drug class. Based on the type, the market is segmented into hospital prescription drugs and over-the-counter drugs. The biotechnology companies are expected to be the fastest growing end-user segment. The over the counter drugs segment is anticipated to be the largest segment owing to some of the leading ophthalmic OTC products like Golden Eye ointment, Zaditor, GelTears, Otrivine Antistin, Alaway, Brolene, and Viscotears. The ophthalmic drugs market is divided on the basis of disease indication into the dry eye, allergies, glaucoma, retinal disorders, inflammation/infection, uveitis, and others. The retinal disorder segment is likely to dominate the market due to the high incidence rate of age-related macular degeneration and other factors. However, the chances of occurrence for age-related macular degeneration increase with age. Moreover, the dry eye disorder segment is also likely to foresee lucrative growth in the forecast period due to increase in high incidence rate of this condition. Diabetes mellitus is considered as one of the leading risk factors for the Dry Eye Syndrome (DES), as per the stats provided by NCBI. In 2016, the prevalence of DES in diabetic patients was almost 10-35% in patients with an age group of 62 years and above. Based on the distribution channel, the market is segmented into hospital pharmacies, retail pharmacies, online sales, and others. The hospital pharmacies are expected to be the fastest growing segment in the forecast period. Growing prevalence of ophthalmic diseases and rising population are the key factors leading to the progress of hospital pharmacies globally. Regionally, the market for ophthalmic drugs market is segmented into Europe, North America, Asia Pacific, the Middle East & Africa, and Latin America. North America is the leading contributor of ophthalmic drugs market owing to the growing introduction of advanced novel techniques and drugs and the rising cost associated with the therapies. Moreover, the other major driving factor of the market is the fast development of the healthcare sector, which is predicted to support the growth of the ophthalmic drugs market across the region in the near future. 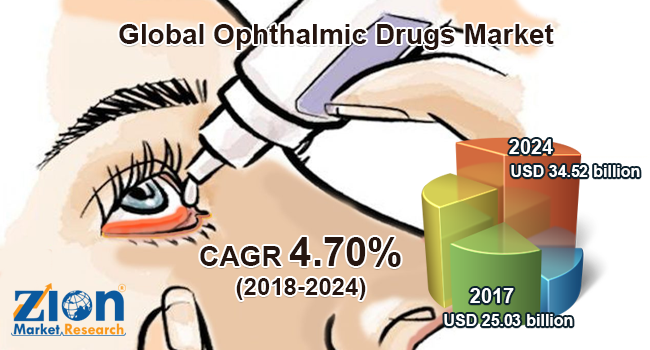 Some of the leading players in ophthalmic drugs market include Allergan Plc, Regeneron Pharmaceuticals, Inc., Pfizer, Inc., Novartis AG, Bayer AG, F.Hoffmann-La Roche Ltd., Santen Pharmaceutical Co. Ltd., Kyowa Hakka Kirin Co. Ltd., Valent Pharmaceuticals International, Inc., Johnson and Johnson Vision Care, Inc., and Shire Plc.